As embarrassing as it is, I figured I would share my experience so others could learn from my mistakes. Earlier this year I did some work on my VTR, adjusted the valves, installed CBR1000rr forks. 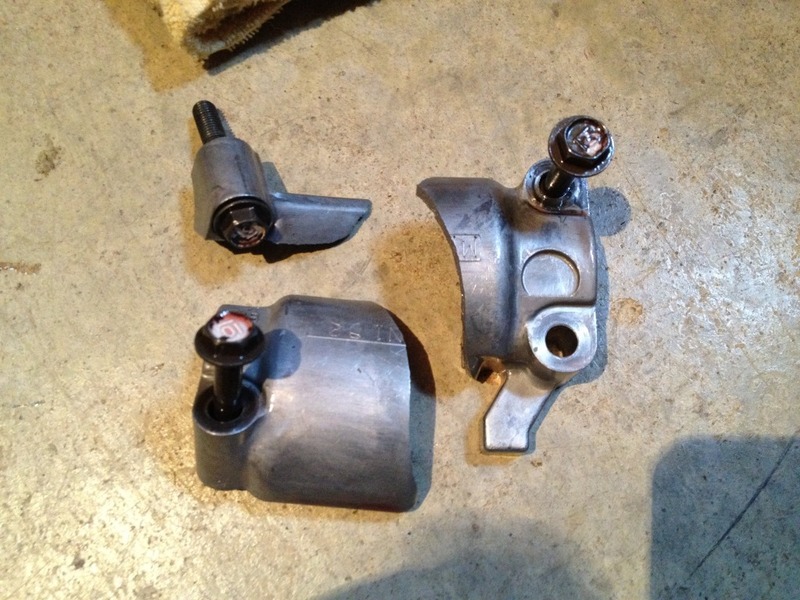 When doing the front cyl I had removed the front manual CCT to remove the cams. I finished the job and it ran good, I started riding it as usual. About 200 miles after the job I was on the highway and started hearing the front cylinder getting noisy. FIRST MISTAKE - I should have pulled over right away on the highway and checked things over, called a friend for a ride and trailered the bike home for inspection. Instead I continued riding, telling myself, "oh it's prob just an exhaust leak since I had the header off". 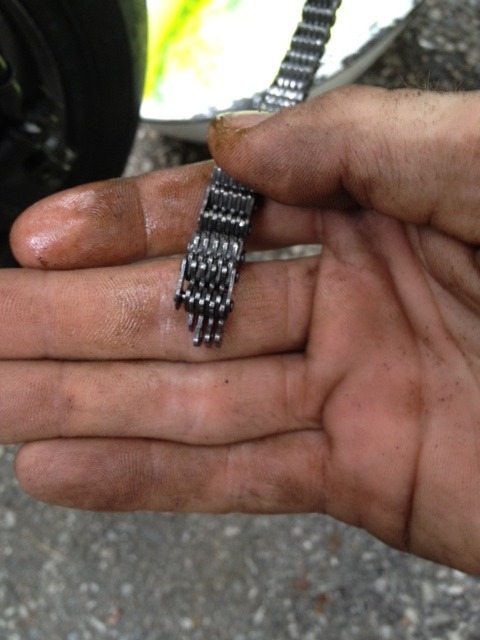 When my exit came up, I pulled off the highway, and at the end of the exit ramp I pulled in the clutch to idle when I heard the tell tale CLACK CLACK BANG POP of the front cylinder grenading itself. The front Manual CCT had backed itself out, apparently I overlooked putting locktite on the shaft when I reinstalled it. 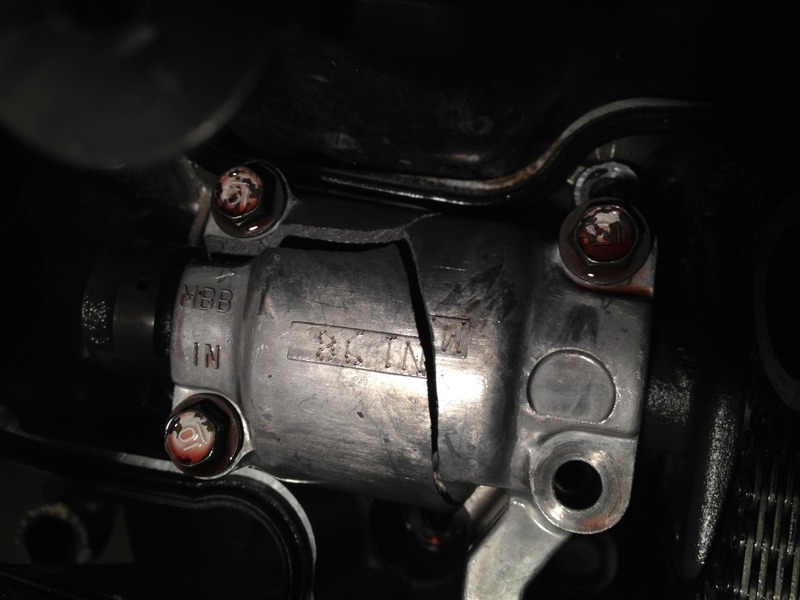 High comp pistons and high lift cams don't mix well with CCT failures. I ordered a replacement front head on ebay for $180 shipped, and got a new head gasket on the way. Parts came in and I did the job, installed the front head, adjusted the front valves again to get within spec. 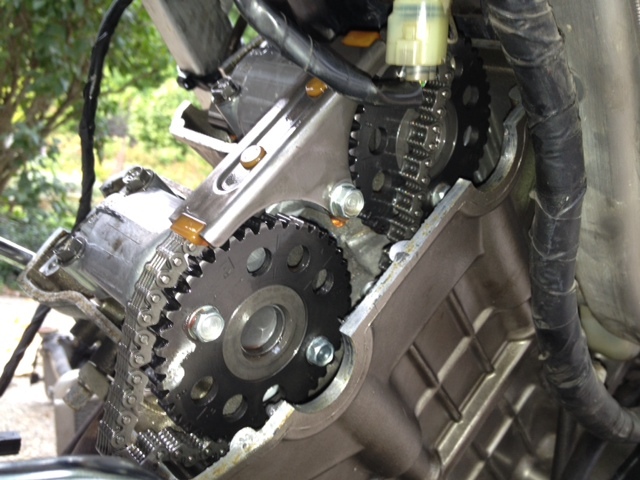 Installed the front CCT as recommended, with valve cover off I tightened it until it was just putting pressure on the cam chain, then backed off 1/4 turn. Put PLENTY of lock tite on this time. I fired the bike up and it sounded good. I let it warm up the first day while idling just to make sure there were no leaks or anything. Then the next day I did the same, started it and let it run to go through a heat cycle again. I was getting ready to go for a short test ride. Then it started to sound like the front cyl was making more noise than before, but I couldn't tell if it was just my imagination or not. NEXT MISTAKE - I should have pulled the valve cover for inspection, or at least I could have backed off the CCT lock nut and see if tightening it would lessen the noise, indicating the chain getting slack. LAST MISTAKE - I took it for a ride. Was just going to go to the end of my road and back, maybe 1/4 mile one way. It felt great going up the road, did a little wheelie, and felt the Moriwaki power once more. Then it all went wrong. I slowed to turn around, starting turning around and I heard a single loud POP and felt something through the frame and it stalled. I fired it up again, and it rode me home, but felt like maybe a front cam had skipped and changed the timing, there was much less power. My best guess is that the first failure caused a weak spot in the cam chain, and the second time around it began to stretch because it was weakened, and going up the road stretched it further until it jumped timing again, only this time the chain lost the battle, where the cam tower/cap took most of the force the first failure. any other guesses? It could be that I didn't have the CCT adjusted properly, but I know it wasn't too loose, and the CCT bolt didn't back out. I think it was weakened and began to stretch the minute I started it back up. There is a chance in combination to all the above that the chain gave up because of a little over tightening of the CCT as well. I don't think that I had the CCT too tight, I followed the same recommended procedure as the first time I installed them. Finger tight until you feel resistance, than 1/4 turn back off. I did it while watching the chain and chain guide. I could see the guide just start to push on the chain when you feel the resistance with your fingers, then 1/4 turn back off, the guide and chain can just move a little without the guide being pushed into the chain. This may end my VTR days for now, keep an eye in the classifieds for the part out. Racing my FZR is draining my wallet, so I need some increased funds for the rest of the season. Thanks for sharing your experience. You know your way around the bike and you've done some great things with it. I hope you decide to put it back together rather than part it out. I do have a spare motor in the barn I could throw in, or I've though about pulling these pistons/cams to put into the spare motor. There was one slight score mark in the current cylinder, so I'd have to do a good inspection of these pistons and make sure the still are in spec. I'm also considering swapping the cam chain from the spare motor onto this one. But with an end goal of sellling the bike whole to make some money, it just makes more sense to part it out. I know how you feel about balancing projects! Your thread caught my interest because you have cams, there's a possibility of them going up for sale some day, and I need said cams. lol, you do have a lot of nice parts but selling the bike outright is less work. Don't worry, there will always be a special place in my heart for the VTR, and the V-Twin motor in general. I have learned a great deal about these bikes in the few short years I've owned one, so I will happily lurk around and offer any advice or knowledge I have learned. I'm not sure on the internals yet, the pistons/cams and exhaust might get squirreled away for if I get another VTR some day. But I might just sell them, I'm not sure what to ask for used cams. Are they still available from Moriwaki or are all these parts getting super rare? I once met a guy at NJMP who had a superhawk with Mori pistons/cams, he said he always drooled over the Ti exhaust but could never pay the $1800 they were when new.. He said if I EVER sold them he would buy them. Unfortunately for him I lost his number. Selling the bike outright would be less work, IF it was running. A pile of parts like this would never sell for the same price as if it was running.. Even then I could probably get as much or more selling everything individually. The only option I have found for performance cams is to send the factory bumpsticks out to be hardwelded/reground. I was just throwing it out there that if the bike was parted you'd have a buyer for the cams (maybe some other stuff, too). Anyway, some of the parts you have are no longer manufactured or I would have already ordered new! By the way, the FZR project is a neat bike. Your Brand New "Gixxer".... Teaches You A Lesson.